Ethiopia’s Productive Safety Net Program (PSNP) is one of the world’s largest food security programs. The program supports chronically food insecure rural households and at the same time promotes long-term food security through the creation of rural infrastructure. While studies on the PSNP have examined various features of the program, there is limited knowledge on the quality and durability of infrastructure built through the program. 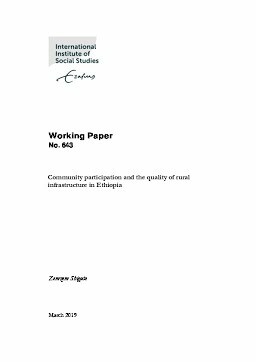 Ensuring and maintaining the quality of local public goods built through the PSNP and similar social protection programs is a costly and recurring issue. Motivated by the long-term objective of the program, this paper analyses the role played by a key design feature of the PSNP, that is, its Community Based Participatory Watershed Development approach in influencing a project’s physical condition and its operational status. The paper is based on survey data and technical assessments provided by soil and water conservation engineers covering a sample of 249 Soil and Water Conservation (SWC) projects located in 53 watershed communities. The survey is complemented by qualitative information gathered through interviews and discussions. The location of multiple projects, with differing levels of participation in the same watershed communities permits estimation of the effects of community participation after controlling for community fixed effects. We find that projects in which beneficiaries play a larger role in project monitoring and evaluation are substantially less likely to be damaged and be in better operational condition. These results support the idea that community participation translates into more durable infrastructure.